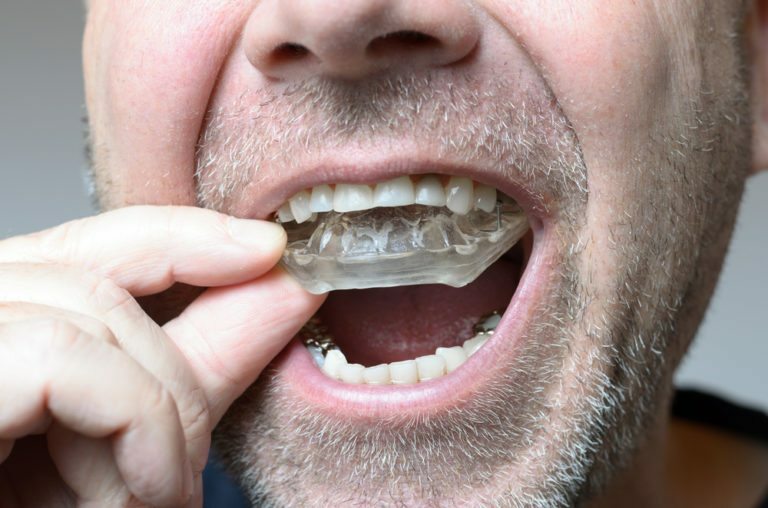 Dental mouth guards / dental night guards can be custom-made by your dentist, and usually consist of a flexible plastic that has been molded to fit the specific shape of your teeth and bite. These guards can help protect your teeth and jaw from a number of different physical activities and sports where your mouth may get hit, including football, basketball, and boxing. These guards may also protect the soft tissues in your mouth, such as your cheek lining, lips, and tongue from damage. Dental night guards are also commonly recommended for those who engage in nighttime teeth clenching or grinding. No one knows what causes teeth grinding, but it can be very damaging to your teeth. Over time, your teeth may become worn down, and can even chip or break due to the nightly pressure and friction of your teeth rubbing back and forth. Prolonged teeth grinding can even lead to more serious dental issues such as TMJ, changes in jaw and bite structure, and even hearing loss. A dental night guard helps protect your teeth from this damage. Signs of nightly teeth grinding may include jaw soreness that spreads down as far as your neck and shoulder, and up as far as your ears. If you suspect that you may be grinding your teeth at night, or if you participate in sports or other activities where your mouth may be hit, call Stonebridge Dental today at 972-547-0554 to schedule a consultation. Our staff is well-trained in the symptoms of nightly teeth grinding, and can help you treat and identify any underlying causes. Our dentists will be able to make you a custom dental mouth guard that will help protect your teeth and jaw from damage, and help you keep your smile looking great. After all, it’s better to avoid damage to your teeth than to need a dental restoration later.